In the past, wearable computing was an ideal of the future. Now, it is a future we live in. We used to dream of building robots; todays scenario is that we may become robots ourselves. 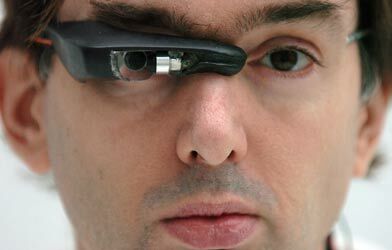 Steve Mann, a professor of computer engineering at the University of Toronto, has been pursuing the dream of wearable computing for more than twenty years. An exhibition at Gallery TPW this past summer displayed the artifacts of the sci-fi reality that is Manns daily life. Since 1980, Mann has worn an evolving prototype. It involves a computer screen attached to a pair of sunglasses with video, audio and data links to the Internet. It is a device that causes the eye itself to function as both camera and display. A computer-controlled laser light source is directed into the eye and is made to be responsive to rays of light that have otherwise entered the eye. The continuous data stream that results was, for a two-year period between 1994 and 1996, continuously available for visitors on the HTML and is just one part of a complex project that underpins Manns alignment of prosthetic computing with socio-political critique. You are currently browsing entries tagged with EyeTap digital eye glass at Army of YouTube.